My original plan was to hike from Dayan Nuur to Tavan Bogd, a distance of approximately 100km. Unfortunately, due to a mixup with entry permits, my friends and I were limited to doing some day walks around the Lakes region at the southern end of the park. To access Altai Tavan Bogd National Park, whether it be from the northern or southern end, you will need to arrange private transport. I recommend doing this in Olgii rather than in Ulaanbaatar. My friends and I arranged a driver in UB, and it turned out to be a bit of a nightmare. One local company which has a base in Olgii is Blue Wolf Travel. They are not the cheapest, but from all reports they are reliable. Topographical map: 1:500,000 M-45 / L-45 Ulgii. At this scale detail is obviously limited, however there doesn’t seem to be too much in the way of alternatives. The topo map can be bought at the Cartography Co Map Shop in Ulaanbaatar. This is probably the only place in the whole country that sells topographical maps to the public. Helpful staff. Unless you want to be liable for a US$100 fine and given a 72 hour deadline to leave the park (speaking from personal experience), do not attempt to hike in this area without a permit. No joke. There is no wiggle room on this point. Make sure you obtain the both the Park permit and the Border permit before leaving Olgii. My friends and I made the mistake of trusting the advice of our driver that we could obtain permits in Tsengel. This was not the case. Similarly, permits cannot be obtained once you are in the park itself. Bring all supplies from Olgii. The Lonely Planet Mongolia guide is a good source of general information on the area. Hiking around the Lake Region is relatively flat and easy. Wide open spaces mean navigation is straightforward. Just make sure you don’t drift too far west, lest you find yourself in China. Gorgeous area. 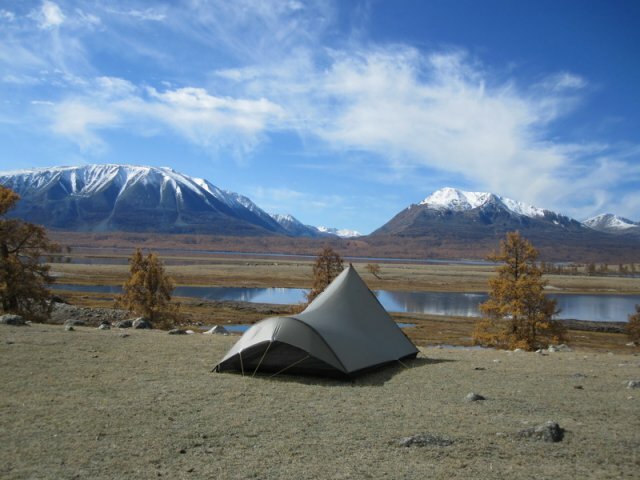 I would love to return one of these days and hike NW from the Lakes up to Tavan Bogd (Mongolia’s highest mountain). Suffice to say I will be triple checking my permit before leaving Olgii. Think I may employ a different driver as well.